Did you know that you can gather pretty spring flowers and put them into a salad? Not any spring flowers, but those that are of course edible and those that taste incredible. We love to prepare flowers with salads to bring to Easter potlucks, Mother’s Day brunches, and any special events that are happening during springtime. Usually guests at these gatherings are surprised, and delighted, to find our beautiful salads and to learn that they can eat what looks like mere decoration. We love sharing the fact that many edible flowers not only provide beauty, they also offer nutrition by way of vitamins and minerals and they give the body powerful doses of antioxidants. Pansies are the largest of the violas, flowers that are tasty to eat and have a bit of a lettuce flavor. 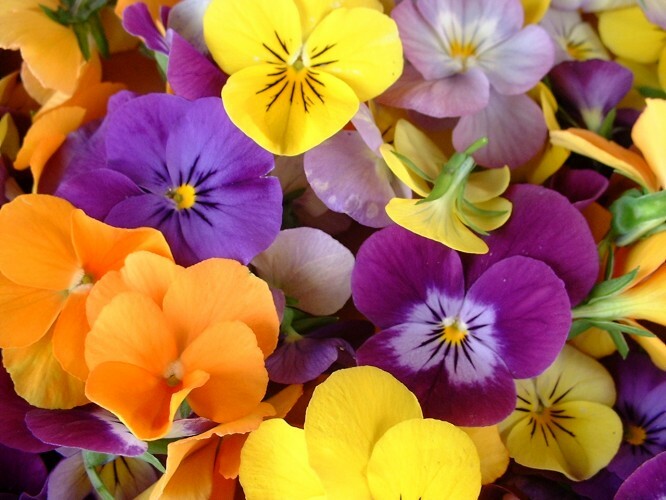 The pansy’s texture is velvety, so these petals will go down smooth in every bite. If you like a spicy and sweet salad, add carnation petals. The carnation’s flavor is unique, and quite surprising, so taste these petals first to gauge how many you want in your salad. Calendula is one of the more traditional flowers used in food. The yellow or orange petals are daisy-like in appearance, which makes them perfect for inclusion in dishes served during the daytime when it’s sunny and cheerful outside. Bachelor’s button is a spiky flower, so be warned that the texture will be somewhat like radicchio. This flower comes in colors that are exquisite, however, which makes it worthy of adding to any salad. In addition to these, you can also use nasturtium and rose petals in your springtime salads. Be creative with flower petals and you’ll end up with a meal that offers amazing visual and palate appeal. Did you know that you can gather pretty spring flowers and put them into a salad? Not any spring flowers, but those that are of course edible and those that taste incredible.We love to prepare flowers with salads to bring to Easter potlucks, Mother’s Day brunches, and any special events that are happening during springtime. Usually guests at these gatherings are surprised, and delighted, to find our beautiful salads and to learn that they can eat what looks like mere decoration.We love sharing the fact that many edible flowers not only provide beauty, they also offer nutrition by way of vitamins and minerals and they give the body powerful doses of antioxidants.